We have a wonderful British pie shop in our town in a dangerous location since it’s on the road where I pick up my son from school. In the afternoons when they bake their pies, you can smell them all the way down the street. And they smell so good. Occasionally on a Friday night when I don’t want to cook, I’ll walk to the shop and order a chicken tikka or chicken pot pie. I just love the way they use great quality chicken and a wonderful blend of spices. This week, I wanted to replicate the delicious chicken pot pie recipe but without the heavy pastry that goes with it and make it dairy-free, gluten-free and lighter for a weeknight family meal. I played around with different ingredients in my slow cooker and this came out so well! I like to brown my chicken first for extra flavor but it’s not necessary. Using chicken thighs is a really affordable way to cook chicken and by cooking them in a slow cooker, they become so tender. The final dish tastes only a little coconutty but it’s not overpowering. Is coconutty even a word? Ok, I just made it up. You can eat it as a soup or with rice or crunchy bread on the side. Perfect for autumn days! Additional vegetables: you can also add green beans or spinach at the end too. I like to brown my chicken first before putting it into the slow cooker, but it’s not necessary. If you do want to brown the chicken, place in a large pan with olive oil for about 3 minutes on each side on medium high heat. 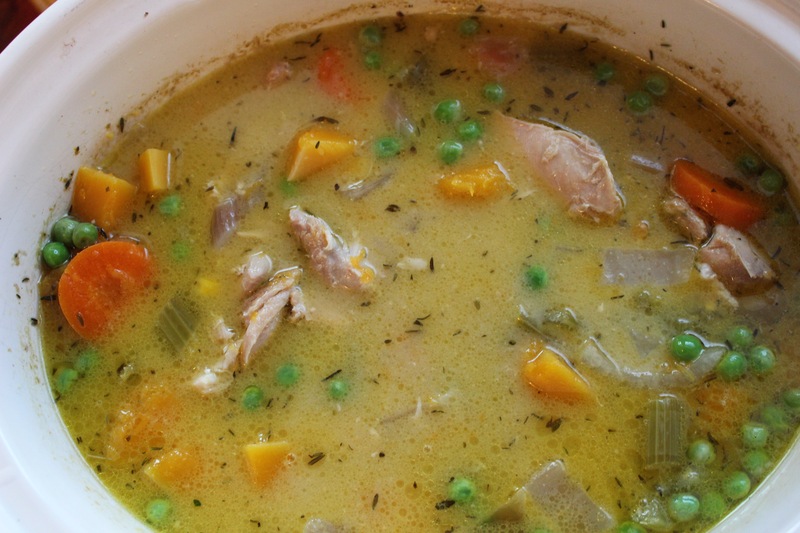 Place the chicken, carrots, onion, carrots, celery, onion, butternut squash in the slow cooker. Pour over the chicken stock and unsweetened coconut milk. Sprinkle over with salt and pepper. Turn on your slow-cooker to high and cook for about 3-4 hours and when the chicken and squash are tender. Break up the larger chicken pieces with a knife or fork into shreds or smaller pieces. Finally, add the corn and peas, thyme or tarragon and any extra salt and pepper to taste and allow to cook for 30 minutes more. Serve hot in bowls with bread or rice on the side.